2012 was terrific…hoping 2013 will just build on that! I don’t usually do resolutions, but this year I have several things that happen to coincide with the calendar change. I was cleared to workout, so I’m stepping up my healthy efforts all around. I also started my first post-baby challenge and accountability groups so I could join in myself. To organize my new priorities and work on the mom me, I’ve decided to redo Chalene Johnson’s 30 Day Push. I’m excited for it as last time I was pregnant and it was very focused on that period of time for me. My goals centered either around pregnancy or had time constraints that were related to pregnancy. So now is a great time to use the 30 Day Push to refocus! 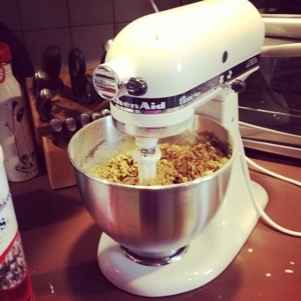 Not new years related, but I finally used my new stand mixer today to make lactation cookies! The first step of creaming the oil and sugars was where I noticed the most difference. So easy!